". . . South Dakota is full of world-class attractions, natural wonders and unbelievable beauty . . .
and majestic rivers of our prairies, this is truly the land of Great Places. monumental history lesson for all who come to see them . . ."
What American schoolchild isn't familiar with the epic sculpture featuring the chiseled (sorry, couldn't resist!) faces of George Washington, Thomas Jefferson, Theodore Roosevelt, and Abraham Lincoln, four of our country's most revered presidents? They might not be able to recite the names of all four of the figures and they might not know what state is home to the famous carving, but they probably have heard its story or at least have seen photos of it by the second or third grade. This is one of those national treasures that I think every American citizen should visit, preferably when they're young and impressionable. It's sort of goose-bumpy patriotic, the kind of place that makes you proud of your country regardless of your ethnicity or which political party is running the show at the time of your visit. The next photo is an aside, so I can show you a photo of the monument that caught my eye in the South Dakota Air and Space Museum this week. It amuses me in light of current politics: the public outcry recently over the cost of filming Air Force One flying around the Statue of Liberty. Ha! 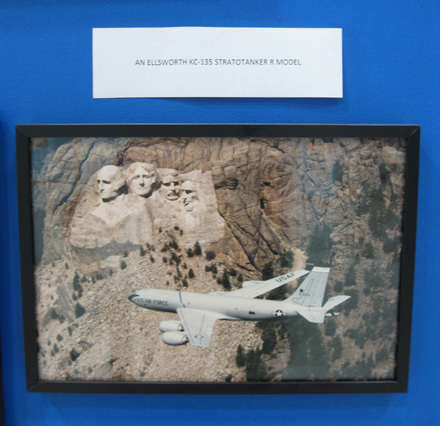 Wonder how much taxpayer money was used to film this plane (and others) in front of Mount Rushmore -- and did anyone even know about it unless they visited the air museum? Back to my other point . . . unfortunately, South Dakota isn't one of the most central of states and, despite all of its scenic and historic treasures, it isn't at the top of many people's lists of vacation destinations. I think it should be. 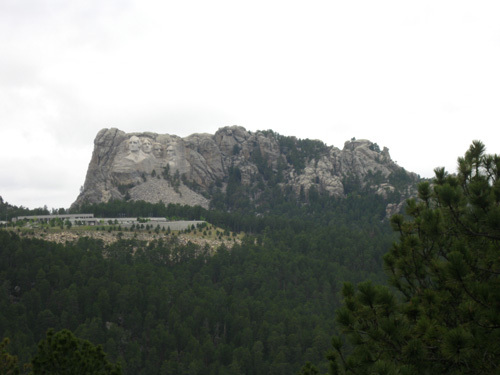 Although I've been traveling all over the country since I graduated from college several eons ago, I didn't have the sense to visit Mount Rushmore until almost three years after moving to "nearby" Billings, Montana at the age of 50. That's still a six-hour drive from the monument but at least it was in the ballpark. 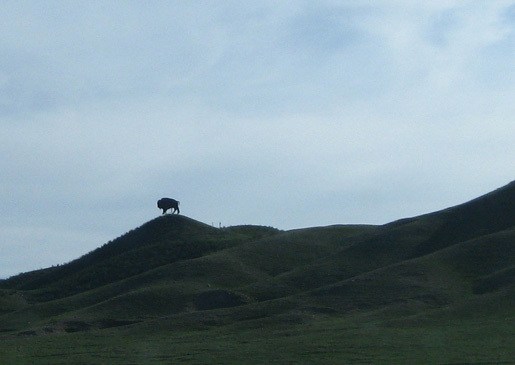 If you've ever driven through the remote and humongous state of Montana, you know what I mean. Even so, it wasn't until October of 2002, when Jim and I decided to check off another marathon or ultra on our "50 States" list by running the Mount Rushmore Marathon, that we added a visit to the monument itself almost as an afterthought. I mean, we were that close (holding thumb near forefinger) that we might as well go see it in person . . .
After that visit we were sorry that neither of us had ever taken a special trip to the monument earlier in our lives, or at least detoured from 1-90 on one of our more recent trips between Billings and the eastern part of the country. If you haven't been there, go see it and enjoy the surrounding area. If you're a runner or hiker, there are hundreds of miles of trails through the Black Hills National Forest; two of them stretch for more than 100 miles (Mickelson and Centennial trails). There are even several footraces of various lengths, including the relatively new Lean Horse 100-miler. More about that later. Now we're in the beautiful Black Hills area of southwestern South Dakota again, taking care of some business in Rapid City. We don't plan to go back to the monument again this week but we'll be very close and hope to catch glimpses of the carving from Custer State Park tomorrow. We'll still feel that overwhelming sense of pride in our country, even from zoom-lens length away. 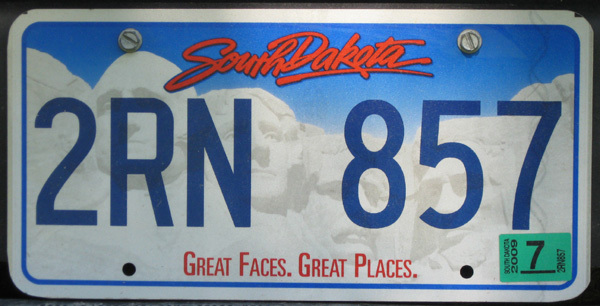 are featured on South Dakota's vehicle tags. 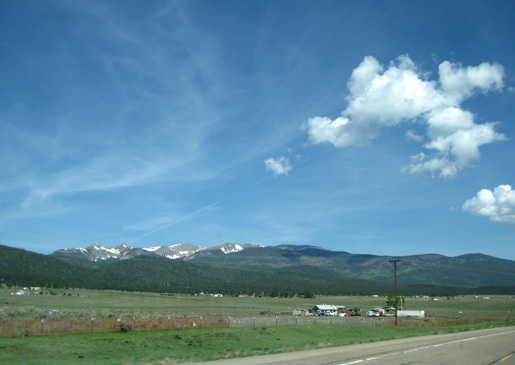 We left Los Alamos on Monday morning, another bright, warm spring day in northern New Mexico. 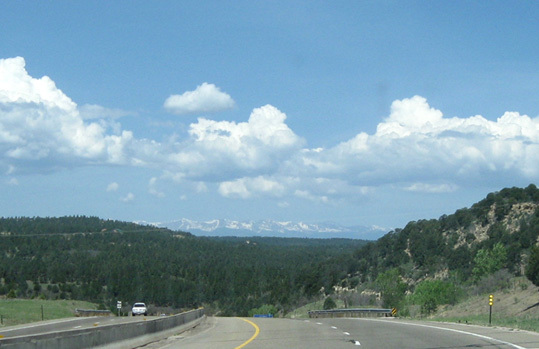 We needed to get over to I-25, which we'd follow north through the entire length of Colorado and into Wyoming. Time to break out the maps . . .
Jim prefers computer software; I still prefer real paper maps. There is no fast or direct route to I-25N from Los Alamos. We could go back south through Santa Fe and hop on the freeway, retracing part of the route when we arrived ten days earlier, but it'd be adding on a lot of unnecessary miles. I talked Jim into going the most direct, and hopefully scenic, way but with the disclaimer that I had no clue how fast it would be. We had plenty of time: two days to knock out about 800 miles. My way was definitely the most direct you can get through a mountain range on paved roads, and probably more scenic than an interstate going through a valley far to the east of the Sangre De Cristo Range, but it was somewhat slow. It took us 3½ hours to drive about 140 miles to the freeway. Some of the mountain roads required lower speeds to negotiate, especially with a camper, and some were being repaired. Little towns along the way also slowed us down but added to the ambiance. I'm glad we went that way! I wasn't in any hurry and I enjoyed the scenery. We drove east on Hwy. 502 and north on 30 to Espanola; both roads are smooth and fast. 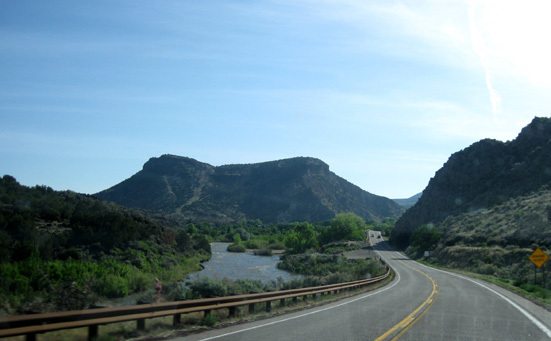 We went east across the Rio Grande and north on 68 toward Taos. We loved the scenery north of Velarde , where the river is close to the road. It was running high, fast, and muddy with spring snowmelt from the nearby mountains. We saw caution signs for elk and bighorn sheep along the road. We were alert for both but spotted only deer. Hwy. 64 between Eagle Nest and Ute Park was slow and winding again. We saw a lot of antique cars on the road here, in the area for a rally near Ute Park. My brother would love tooling around that beautiful countryside in an antique car. 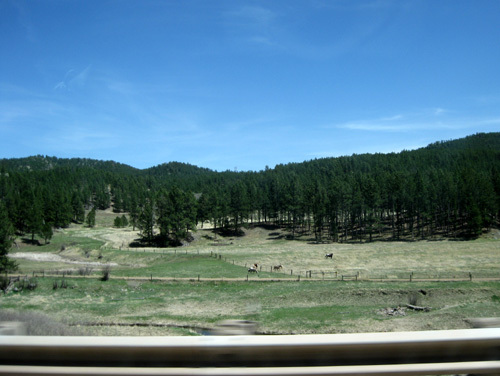 The road was faster to Cimarron even though we were back in the national forest again. At Cimarron we hung a left but continued on Hwy. 64 NE to the freeway. We weren't sure if that tangent to I-25 would be wise, but it was a great choice. We were on or paralleling the old Santa Fe Trail for over thirty miles. Cool! That section of road is almost as fast as the freeway, has great mountain views, and is flush with antelope all over the mesas. We came out on I-25 at Exit 446, about ten miles south of the Colorado border. To me, the Granddaddy of them all is Pike's Peak, near Colorado Springs. It's one of five Colorado 14ers I've climbed. It just shrieks "COLORADO!!" I love it. Too bad we wouldn't be stopping there. We could feel the heat as the day wore on. Through Colorado Springs and Denver our temperature gauge read in the low 90s. We heard on the evening news that various cities along the Front Range and farther north came close to or exceeded their record highs Monday. We wondered how we'd keep cool in the camper that night, boondocking at the Sam's Club near Loveland, CO, where we've stayed at least two times before. We could have run the AC with our generator but by the time we got done restocking at Wal-Mart and Sam's the temps had cooled down enough that we didn't need to run it. It helped that our parking spot far from the store's door was partly shaded by trees. Cody had cool grass to lie on just outside the camper. This place is so convenient we'll probably stay there again on our way back to Colorado at the end of June. Maybe we should lease a space in the parking lot! After supper Jim invited me on a 3+ mile roundtrip walk to a nearby neighborhood park that he found on Topo USA. For once, I didn't take my camera. I didn't expect to see one of the best sunsets over a lake that I've ever seen in my life! Jim had the presence of mind to remember that our cell phones can take pictures. I didn't have my phone, either -- but he had his, and he took several photos of the magnificent display. Unfortunately, the cell plan we have apparently doesn't allow us to download those photos, only send them to another phone. Rats. So here's a photo from the Black Hills instead! That's a minor problem compared to the glitch we had with one of the slide-outs. Our wall clock fell out of a box on the floor while we were traveling Monday and got stuck when I opened the slide. We're always very careful when we open the slides and check to see if anything has gotten in the way. I couldn't see the clock but heard the crunch. I was able to salvage the clock, but the brief force sheared off another bolt and we couldn't retract the slide. The good (?) news is that Jim is by now fairly adept at replacing sheared bolts in our three slides. He's had (too much) practice the last six years. He keeps spare bolts and we both have the drill down pat. I get the inside job, he gets the one where you have to crawl under the camper and get dirty . . .
We coped just fine with the heat and noise (earplugs!) in the Sam's Club parking lot that night and hit the road on Tuesday morning refreshed and full of anticipation. I love it when we get to see something new! We didn't have quite as many miles to drive the second day -- only 384, compared to 432 on Monday. It was a pretty quick trip on I-25 to Exit 126 at Orin, WY. 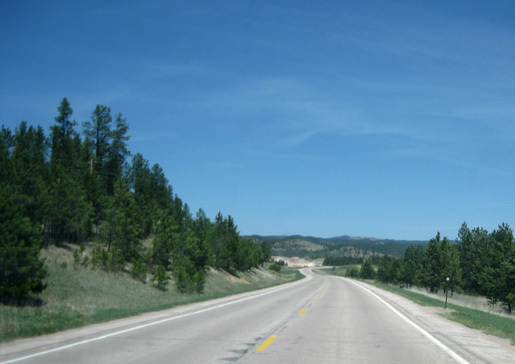 The rest of the route I planned was on what turned out to be very good two- and four-lane roads through eastern Wyoming and the scenic Black Hills National Forest in South Dakota (east on Hwy. 18 through Lusk, Mud Creek Jct., and Edgemont, then north on 89, 385, and 16 to Rapid City). We were happy to find diesel prices along the way that were substantially less than we had to pay in the Los Alamos area, where they escalated to $2.43/gallon. We paid "only" $2.09 at a Shamrock station near Colorado City, CO and $2.18/gallon at the Flying J in Cheyenne, WY. The difference in cost is probably due to state taxes because Flying J usually has the cheapest prices we see along freeways. The only ultra-related part of this segment of our trip is hoping to run on some of the Mickelson Trail while we are in the area. All we knew before our arrival was that the Lean Horse 100-miler uses part of the southern end of this rails-to-trails project. I was surprised how much of the trail that I saw was so close to a busy highway. Tomorrow I plan to run on a part of the trail that is farther away from the road. 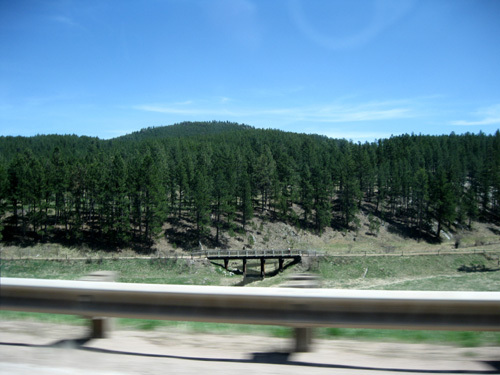 I loved riding right through the heart of the Black Hills, so named because the thick stands of spruce and pine look so dark from a distance. 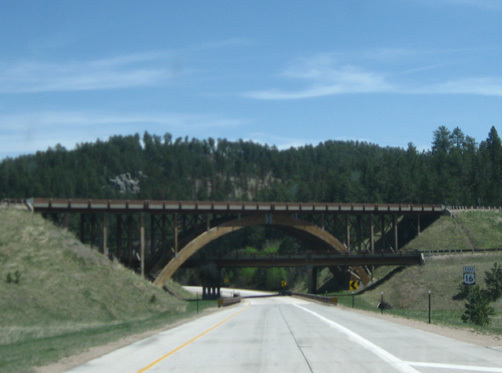 The forest is even quite attractive along the north and east edge as you drive on I-90 between Rapid City and Spearfish. The "hills" are more than just hills. 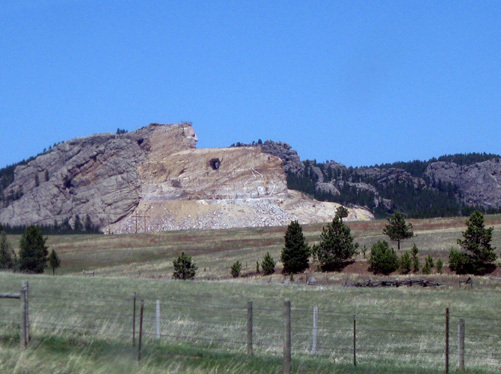 The highest point in the state, Haney Peak (7,242 feet), is located here, just a few miles from Mount Rushmore. 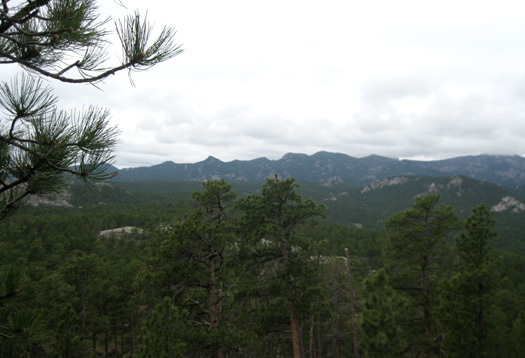 There are quite a few mountains from 5,000 and 7,000+ feet in the 1½ million acre Black Hills National Forest. No, it's not the Rockies but this is my kind of land, with many remote mountainous forest nooks and crannies to explore off the tourist paths. We couldn't avoid seeing some of the more popular tourist attractions on our ride through the Black Hills. The most prominent on Tuesday was the nine-stories tall carving of Chief Crazy Horse between Custer and Hill City. We haven't visited the memorial yet and won't have time on this short visit, but after seeing the impressive sculpture from the road I'd like to visit the site in the future. The face is complete but the rest of the carving is a work in progress. Upon completion, the chief astride his horse will reportedly be the largest statue in the world. The sprawling visitor complex includes scale models of the sculpture, exhibits, the Indian Museum of North America, an educational and cultural center, and the studio-home-workshop of the sculptor, Korczak Ziolkowski, who is working on the statue at the request of modern Lakota chiefs. We passed more commercialized attractions closer to Rapid City. You know, the ones with caged bears and souvenirs like gaudy t-shirts. Yuck! Fortunately, the beauty of the forest and the attractiveness of the small city as you enter high on a cliff from the south overshadow the tacky stuff. We did plenty of research before arriving in Rapid City but we weren't sure where we'd stay for the next three nights until we eye-balled a couple of camping options. Wal-Mart was the first place that needed to be assessed, since it was free. Because this is a popular county and state for full-time RVers to call their legal residence, Wal-Mart encourages them to stay in their parking lot for up to three days (and buy stuff in their store, of course). I've never heard of that anywhere else; RV newsletters, magazines, blogs, and other and websites always admonish campers to be as discrete as possible at Wal-Mart so the privilege isn't withdrawn: don't set up your lawn chairs or grill, don't open up your slides, don't ever unhook your tow vehicle (or "toad") and leave the camper unattended, don't stay more than overnight . . . In other words, look like you're parking, not camping. So three nights at Wal-Mart, with the blessings of the city?? Unheard of. Despite the temptation we decided we couldn't handle that particular Wal-Mart lot for three days, especially in the heat. It was 93° F. when we arrived in town Tuesday afternoon!! That's pretty unheard of so early in the season in Rapid City, too. In fact, most campgrounds in the area were just opening up for the season. We are very happy that we decided to stay at the FamCamp at Ellsworth AFB a few miles NE of town. We chose one of the twenty-five level, paved sites with spacious grass "yards" and full hook-ups. We had researched the campground on the internet and knew that it opened only three days before our arrival. Usually the weather is much cooler than this in May and there aren't enough visitors to open it earlier. It was two-thirds full when we got there. There are a couple of trade-offs we made camping at Ellsworth but they turned into assets. First, the only available sites when we arrived that receive a reliable WiFi signal both had broken water connections. We could have water at several other sites with no WiFi, or fill our water tank before parking and have a strong internet connection. Jim's laptop has a built-in WiFi connection. My PC doesn't but Jim fixed that with a spiffy Linksys wireless USB network adaptor with range booster by Cisco, which he picked up for a good price at the nearby base exchange (BX). We found a similar one at Sam's Club for the same price. It's about the size of a thumb drive and connects to a little base that you sit on your desk (or hang from the little knobs on your camper window shades). For the same amount of money it costs us to get broadband internet service from Verizon each month, we now have a faster, more permanent solution that is ours to keep. Of course, the catch is that we have to be close enough to someone's WiFi signal to snag it out of the air (with their permission). We should also have WiFi for the month we're staying at Foothills Campground in Wyoming, our next destination. So Jim cancelled our broadband service until we are camping somewhere without WiFi we can access from the camper. The gizmo will pay for itself before we leave Foothills. The second trade-off at Ellsworth AFB is the occasional VERY LOUD NOISE, so far only during daylight hours. 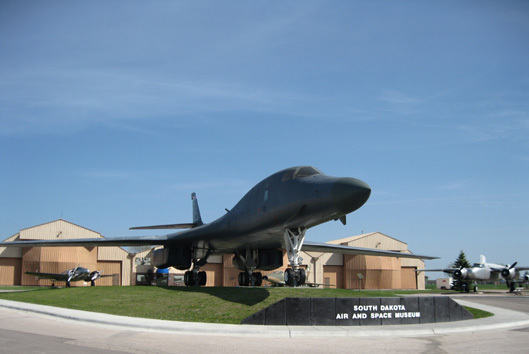 This is where the U.S. Air Force pilots do most or all of their B-1 bomber training. 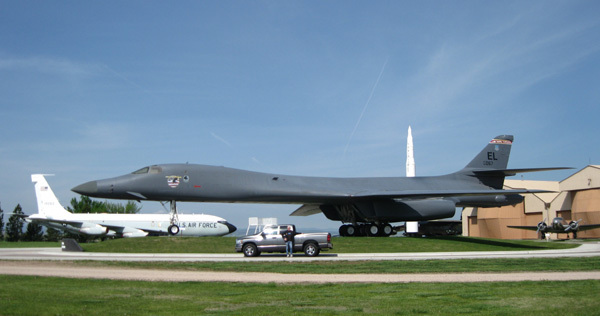 Have you ever been close to a B-1 bomber when it's taking off??!! Whoa, baby. Get out the earplugs! Or be full of awe like us and stare into the sky, transfixed, to watch them soar into the wild blue yonder. Impressive. Hmmm . . . from the creation of the atom bomb (Los Alamos) to the home of our country's B-1 bomber training (Ellsworth AFB) in two days . . . strange coincidence, and in no way planned. Visitors can take a guided tour of the Air Combat Command and see a Minuteman missile silo but we didn't have time to do that on this visit. 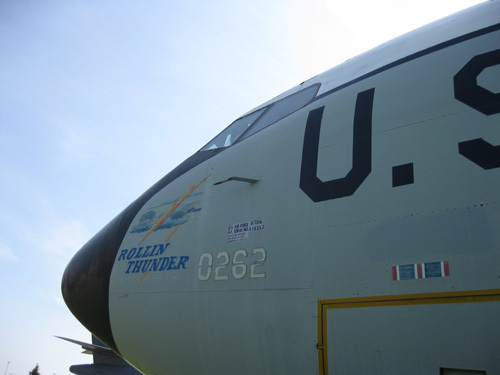 We did go into the South Dakota Air and Space museum near the main gate to learn more about aviation history at the base and view aircraft inside and out, including a stealth bomber, General Eisenhower's Mitchell B-25 bomber, and a variety of fighter, cargo, and utility aircraft. 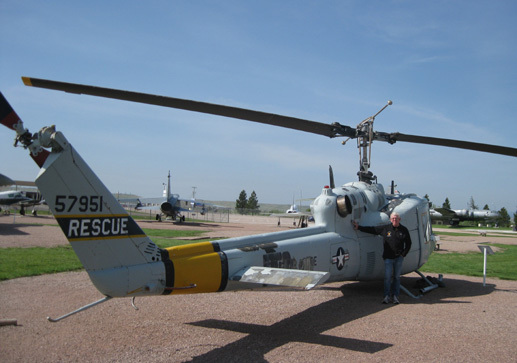 Jim checks out a Huey. He manned the radios in Hueys with gunners and no doors in Viet Nam. 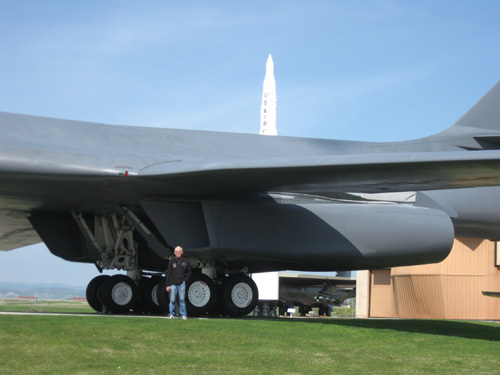 You can see how big the bomber is with Jim and the truck nearby for perspective. 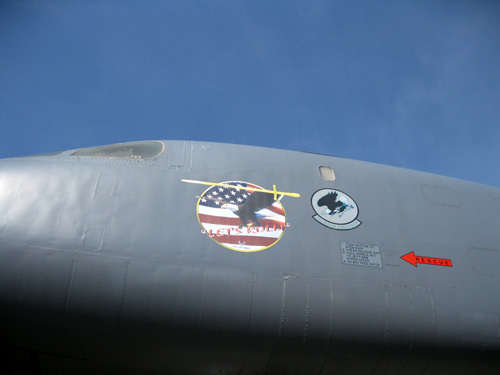 We can highly recommend the campground at Ellsworth AFB to other retired or active duty military families. Getting through the security gate is not a hassle, but you have to know to go in the "commercial" entrance if you're in a camper. That's the only place a big rig can maneuver through the concrete barriers. Camping is first-come, first-served. If you arrive early in the week like we did, you should be able to get a spot, even the week before a holiday (Memorial weekend is coming up). We had good cell phone and TV reception. The cost is reasonable for full hook-ups ($20/night) and there may be a discounted monthly rate. The campground laundry (behind the bathhouse) is clean, convenient, and less expensive than going to a commercial laundromat. It's easier to find your way around the base than some others where we've camped. We didn't have time this trip to hunt for any running trails on base but there are plenty of roads through the base housing areas that would have been suitable for running. Jim's still recovering from the Jemez race and I plan to run on the Mickelson Trail tomorrow.